“The I AM LOVE PROJECT was created from a vision where everyone is worthy of love, should be loved, and feel loved regardless of age, colour, gender, or race. Our mission is to continuously encourage self-love; a practice which allows us to enjoy a positive relationship with ourselves and others. A mindset that is cultivated through the support of the community and backed up with heart. This is a quote from the I AM LOVE project mission statement. I’d also like to mention that it was posted on July 1, 2018! Despite being a new initiative in the Winnipeg area, the I AM LOVE project has already impacted many, many lives. Here is the story of the impact Amy Tung and the I AM LOVE project in Winnipeg, MB! I met Amy Tung at one of the Pop Up Yoga events that the I AM LOVE project puts on. It was actually only the second Yoga fundraising event that Amy had organized through the I AM LOVE project! Jodi, one of my good friends (more on her later!! ), posted about a Yoga event she had gone to and right away I sent her a text asking what the fundraiser was for and if it would be something she’d be interested in doing again. She told me a bit about the premise of the I AM LOVE project and said she’d love to go with me in August, so we signed up! The event was the day before my birthday and I was inspired by the idea of giving back to my community (a great way to start my “new year”)! I love to do Yoga, so that was also a good fit! There were great local businesses that were sponsoring the event (more on one of my favourite Winnipeg products later)! Amy Tung, the amazing founder of the project, came up to my friend and I after Yoga and thanked us for coming. Amy actually remembered Jodi (my friend) from the previous Pop Up Yoga event. She was SO nice. Jodi and I joked afterward that we thought we were nice and then we met Amy and were so pleasantly shocked that people like her existed..we decided that we needed to step up our “niceness game”! The charity for August was for the Mood Disorder Association of Manitoba-a smaller charity that really benefited from the money that was being fundraised as well as the advertised awareness for the organization. It was such a nice change to support a smaller organization, one that people may not know about but one day may need the assistance of or know someone who might benefit from its support. Seeing the support of many local businesses was special and inspiring. There was a beautiful vibe at the event. I wanted to be part of the next cause, even if it was only through my $20 donation. Amy Tung and her amazing will to make the world a better place. The reminder that people are out there helping other people. Despite all the terrible things we hear… we need to remember that there are awesome human beings that are directly impacting people’s lives and the social sustainability of our community. It might inspire someone else! 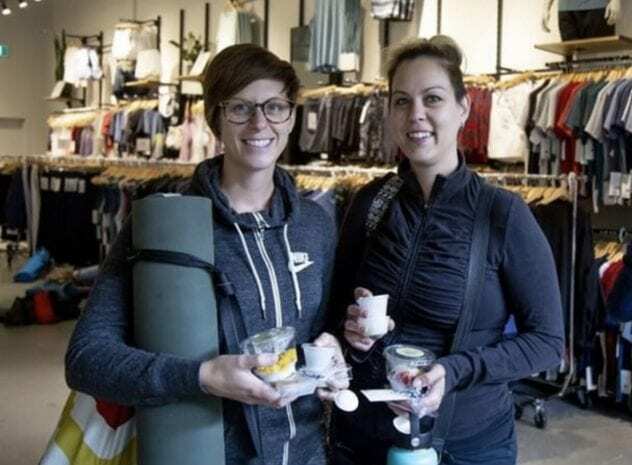 -First Jodi went to a Pop Up Yoga fundraiser, then Jodi and I went, then Jodi, Penny and I went and now I have people asking me to join us the next time we go! -and this is only the beginning! I am truly honoured to introduce Amy Tung and the I AM LOVE project to you via an interview with Amy…. Amy! Can you tell us a bit about yourself?! I grew up in Winnipeg with one older brother, and most of my childhood, as well into my early adulthood, was devoted to helping the family business. Then I graduated University and decided to move to Hong Kong and I managed a makeup and nail salon for a while. When I moved back to Winnipeg, my brother and I started a business together and later on I started working for H&M. While I was working for H&M I realized I was more suited to HR so I took courses and started applying whenever I saw an opening to non-profit organizations, admin positions, anything related to HR. I didn’t get any phone calls but that just made me realize even more how much I wanted to help people. I get motivated in doing the work I do now, by the people around me and other like-minded people who I’ve gotten to know. I know I was supposed to talk about me but I ended up talking about how I got to this position, but I think the work you do kind of defines what kind of person you are; I’m passionate, caring, and I like the motivation I get from being under a certain amount of pressure. I work hard to help others and I want to share that occupation with other people. I want to continue to share love, to continue this chain of love. I want everyone to be able to say I Am Loved. Where did the idea for the I Am Love Project come from? I think in a lot of ways, it came from how I was living my life and how I wanted to be, and how much I wanted to do for the people around me and the community I was living in. No matter where you go, you see people who have not been given love, or think they don’t deserve love, or have trouble understanding what love is. I wanted to show others what love can do and that they are all deserving of love, so I began the I Am Love Project. How long did it take for the I Am Love Project to get up and running? That depends on which part you mean. 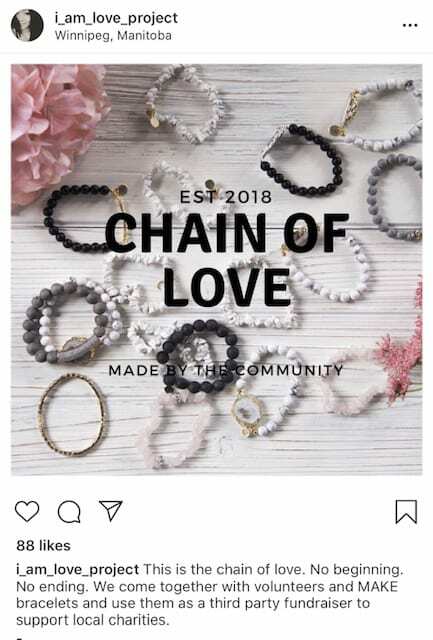 The I Am Love Project started out on my instagram account with motivation and meditation posts, so in that sense, I would say it took half a year, but if we’re talking how long it took for it to become what it’s known for now, making bracelets and pop-up yoga events, I would say 3-4 months. What kind of setbacks have you encountered along the way? Handling rejection and having people not show any interest in what I was doing was dejecting, and in that aspect I was experiencing emotional setbacks. I know that a “no” doesn’t hinder my performance, and it’s really just an opportunity for bigger and better things. I found that finding people passionate and devoted to their cause isn’t hard (we’re all passionate about something) but a setback of sorts regarding collaborations and sponsors, was a lack of guidelines, who was going to do what, and the level of initiative that needed to be reached. I learned I had to dream and to follow my dreams. Set goals around my dreams in order for them to come true. I know what it means to follow your dreams and do something your passionate about. It was always in my mind, but I needed to believe myself and make it happen. Everything is possible. What are some of your best moments of the project thus far? I have a few. One is at the end of every month, where the money denomination isn’t a huge amount but the impact is huge. Little by little, we are able to raise money and know exactly where that money will be going. Another best moment is living everyday to the fullest, I look forward to all the great people I get to meet. They have been super supportive every step of the way. Their eagerness to help, inspires and fills my cup everyday. How has your vision for the I Am Love Project evolved since the beginning? I don’t think the fundamentals of my vision have changed, I still want to spread love, to make others aware that they are worthy of love, no matter what nationality, no matter the age, gender, sexual preference. I want to bring awareness on community issues, mental health issues, youth involvement, and be a source of information for the people impacted by these issues. I think what has changed is how far I want this to reach people. I wanted to support local charities in Winnipeg, and bring awareness to the general public, inform people who may not have been aware that these charities existed. It’s changed from wanting to keep it local to wanting other cities to get involved with their local charities, and keeping that chain of love, that flow of energy and community alive. What are you hopes for the I am love project? Oh my, there’s a lot! In a broader scale, build a stronger community. There are a few things I want to implement. First, make Yoga accessible (incorporate mindfulness in all settings). Second, bringing awareness to smaller charities. Every household should have a book with all the charities and the programs they offer (the charity yellow pages). Third, establish a law where grocery stores need to donate their food to homeless shelters, we can no longer waste food. This will support our charities and help them sustain. No longer will we need to exhaust our man power to secure food sponsorship. Lastly, spread love across borders, across cultures as it should be. Make volunteering and donating fun (statistically there has been a decline). I know that the Future Under 40 has recently come out. Can you talk about what that means to you? I think people thought that I wasn’t excited about being nominated, but I was actually just in shock that I would be nominated at all and honoured, and humbled, and overwhelmed. This is truly an honour. When I found out, I cried and I was speechless, I couldn’t find the words to describe how I was feeling for a few days. I was so excited and elated but none of the words I had were enough to tell people how I felt. That’s when I realized that I’d never felt this way before, and now I know what the emotion “honoured” feels like. It feels amazing. It’s amazing that the I Am Love Project is being acknowledged in such a public manner, and it’s amazing because the project will reach even more people. I’m excited for what this will bring in the future. 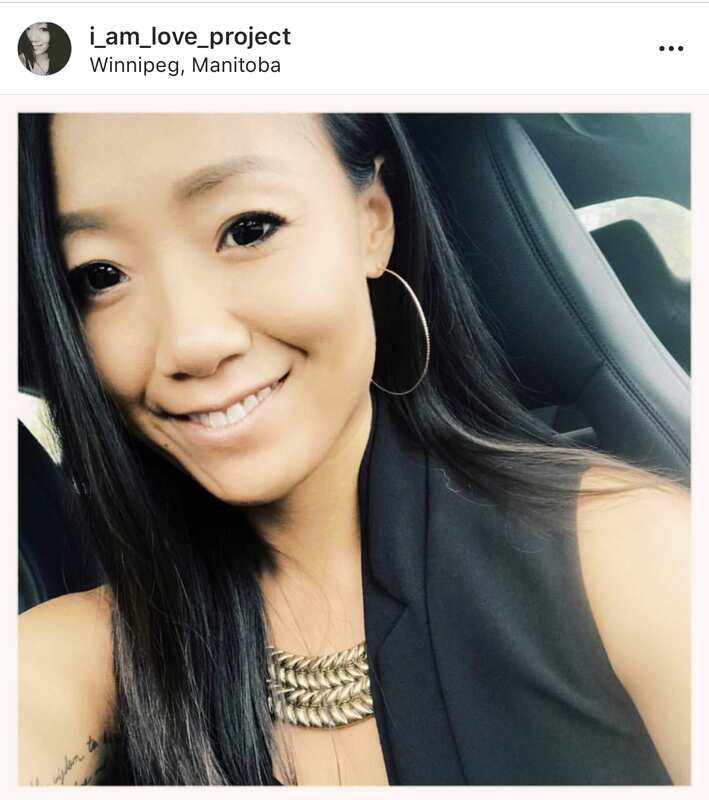 Amy Tung is an inspiring young woman spreading love throughout Winnipeg. Through her volunteer work at West Broadway Youth Outreach and Big Brothers Big Sisters Winnipeg, she found many non-profit organizations lack funding, awareness and engagement. In early 2018, she took matters into her own hands and started a business that will sustain itself and support Canadian charities — the I Am Love Project. Every month, volunteers come together to create crystal intention bracelets in support of a charity that is making a big impact in the community. They select a new charity on a monthly basis. The I Am Love Project hosts pop-up yoga classes featuring different local teachers and venues and at the end of the month they deliver all proceeds to their chosen charity. Within the last four months, we’ve raised over $10,000 for the Women’s Health Clinic, Turning Pages of Mood Disorders Association of Manitoba, Make Music Matter and Westman Dreams for Kids Foundation. Can you talk about the Mama Bear Clan and your involvement? The Mama Bear Clan is an amazing group of women who patrol Main Street to make it a safe environment for everyone who occupies it. They are a volunteer based organization and it’s mind-blowing to see how dedicated these women are and how strong they are. They inspired me, and I wanted to do my part for them by collecting donations and getting them the media coverage they deserve. One is when I’ve made that impact, brought awareness to a charity and now an extra 50 people are aware of this new charity and their cause. Another one is when relationships have been cultivated and you can see the support grow. Having people reach out and want to participate, seeing people be as passionate as me and want to help out any way they can. These are the best, most heart-warming moments. Did you know Cheryl from Cranked Energy before her involvement in the I Am Love Project? I did not know Cheryl. I reached out and she said YES! After getting to know me and all the different things I was involved in, she’s been saying yes to everything. She loves community and she’s been giving back ever since she was a child. How did I hear about I AM LOVE: Through the powers of Instagram – Amy reached out to Cranked via message and simply told me the basics of what she does and whether I would like to meet. I love taking meetings with local entrepreneurs so we met at the Cranked Shop and it was an instant connection made through our love for community and giving back. Why did Cranked get involved: As a business owner passionate about community it can be very hard running a business AND giving back. Energy focused on one often limits energy to put towards another. What I loved about Amy is that SHE is the connector and facilitator of all these amazing projects. Cranked can support her initiatives when and how we choose to. She gives us the ability to join in to existing projects she is working on, or sit down and create an initiate of our own. The key is the the IDEA can come from us, but the real WORK is done by Amy. The other part is that her initiatives support SMALL charities. The underdogs, the ones where $500 makes a HUGE impact. A small business cannot make an impact with big charities. Cranked has often supported Gala’s with donations or bought tickets but it often is not acknowledged or we don’t feel the direct impact because the larger companies with more money are able to get the good promo and acknowledgement due to the $$$$$ support. With I AM LOVE, we can donate a prize or a product, or we can buy 4 tickets to a yoga event and we know that our efforts make a difference. Meeting Amy has allowed me to finally give back in the way I always intended to. Since I was small, I have always given back as best I could. Whether it was money from my allowance to help a friend in need, or time spent after long hours at the office volunteering at Bingos to raise money for charity groups. Kids, career and then starting my own business slowed down my ability to give back. Amy came along and said, no matter what you can or are able to do, we will make it happen. My dreams for giving back have grown even in the last 6 months. It started with donating food to a yoga event. It then grew to weekly donations to Mama Bear Clan Patrol to hand out. It then grew to me taking a day off running Cranked Energy to spend running around the city doing random acts of kindness. We then did a sock drive, bring in new socks and get a free bar. It is now growing into 100 tote bags being shipped to a northern reserve full of products from local businesses, and then an evening handing out 500 coffees, 500 lunches and 500 toques PLUS haircuts for anyone on the streets needing one – Dec 21st. Amy brings an idea to us at Cranked and we say how can we help, what connections can we help you with, who in our community do we know who would love to get involved. Its connecting people through giving back that makes relationships strong and healthy. The focus is less “what can you do for me “ and more what can WE do together for our community. Giving back is an actual feeling, and its a feeling everyone should experience. The problem is not everyone knows how to give back, are scared to, or feel like giving back means money out of their pockets. Amy and I create fun, innovative ways for People to get involved at minimal cost. Can you talk about your product and the role of sustainability: Cranked Energy was created to fill a hole in the market in terms of a fresh grab and go food product, high in nutrients and LOW in preservatives and chemicals. The mission was always to make lives easier for people to eat healthier. When a Cranked bar is purchased, I hope our clients know that their support now funds our community initiatives. As Cranked Energy grows, we are able to give back even more. The staff at Cranked and our sponsored athletes are expected to also give back . We often surprise junior teams or special need athletes with our athletes. Our team is full of people who already do A LOT for community, and when they join Cranked we are able to pull from their efforts while creating our own. In the beginning our focus was creating a business that could provide for myself and my family in a basic way. Today 4 years later, we are sustaining our family and the extra is able to be used for our community- to sustain their needs, support community projects, bring awareness to small charities and how your $ makes SUCH an impact. To show our youth empathy, and how they can. Give back (we do a sandwich drive every few months where the youth from sports teams come make sandwiches for mama bear clan at our Cranked Kitchen). This small act of a team of 14 year olds, showing up for a few hours, making sandwiches using products donated by our community, and then knowing they will be enjoyed by people in need is a small step forward to raising caring youth. Our cranked kitchen I see as not just a kitchen to make our bars to sell. We have the space, we have the people,. We then have the ability to DO MORE. Its a mindset, and a movement I hope we can inspire many others to consider. -Cheryl is also an amazing person! She also makes amazing energy bars! I heard about her bars, tried them once and was hooked! I have NOT eaten a “non Cranked Energy Bar” since May! The bars taste great-like really great! They are fresh. They are produced in the city I live in! There is no transportation cost for shipping the bars…because I stop by when I am in the area! I share the bars with anyone who is looking for a product in the “energy bar market”! -After my first visit to her shop, Cheryl remembered who I was! She was SO nice! We chatted a bit, then a bit more the next time I came in and I soon learned that she was very active in supporting the community. That’s part of what inspired me become extra loyal to her product line! -Who was on the list of supporters for that first I AM LOVE Pop Up Yoga event I went to?!? Yes…Cheryl! Of course she was there, not only to give the bars out as a snack after the class, but also to participate! I learned that she had been to the first event and had plans on continuing her support to the project. -At the most recent Pop Up Yoga I was at for the I AM LOVE project I was chatting with Cheryl and she mentioned her involvement with the Mama Bear Clan and invited my fiends and I to join them walk the streets sometime (which is on the list of things I plan on doing one day-hopefully soon). Cheryl also mentioned some of the people they met on their walks not wanting the food that was being handed out, but wanting a haircut instead, so they could look more “presentable” when trying to find a job. Cheryl said ” I need to find someone willing to donate haircuts”. Well wouldn’t know it…my friend Jodi has her own hair salon and right away said “I’ll do it!”. Just like that the ripple of kindness was spreading! -Cheryl and Amy recently spent the day doing random acts of kindness. These two ladies are unbelievable! They do these acts of kindness because they care. They want to show others that they are loved. They make an impact on our society whether it is to one person, a family, a small group or within the larger community. They are making our world a better place and inspiring others to follow suit. They want people to be aware of what they can do to help out. I really feel like many people want to give, but don’t know how/where/what to do. Cheryl is so right when she says that Amy puts opportunities together for people and is making a huge difference because of her efforts. -I can’t wait to see what these two will do next! Jodi is the friend that I talk about sustainability issues with! She appreciates that I try to be loyal to local shopping and she is trying to put in the effort to do the same. She is also very kind and generous. Jodi drives around with a case of water in case she meets a homeless person, or person in need that could really use a bottle of water. She is also the one who introduced me to the I AM LOVE project. Thanks to Jodi I have a really meaningful organization for this source of vigour project! On Friday, December 21, Jodi will be teaming up with other stylists to donate their time and give haircuts to those in need. Jodi is also part of the local business group who donates to the attendance prizes at the I AM LOVE project Yoga fundraisers. 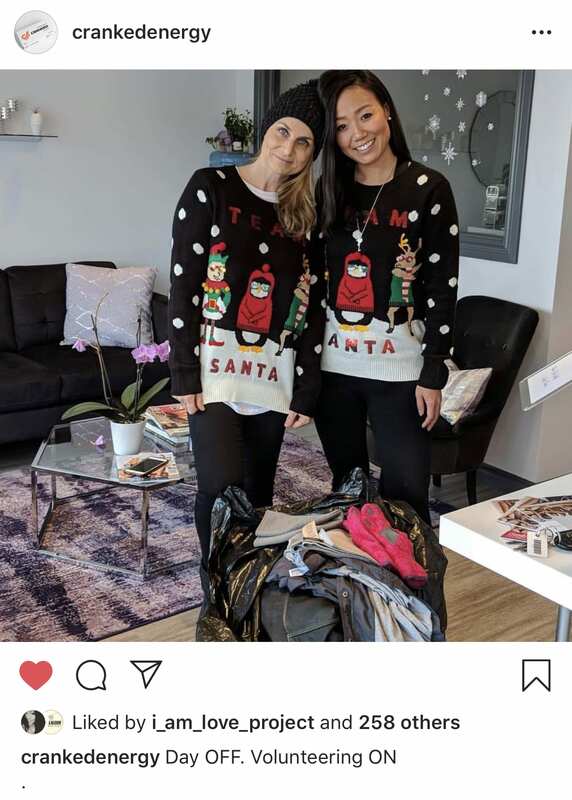 December 21 is also the day that the proceeds from the Love For the Holidays Pop Up Yoga event that I attended will be turned into items of need for those who need them. 500 toques, meals, coffees and feminine hygiene productions will be distributed in Winnipeg. Isn’t that amazing?! This is what the I AM LOVE project is all about! A friend bought me a ticket to the first I Am Love Pop Up Yoga for my birthday as something different to do together. We got to the venue and were welcomed by strangers that did not at all feel like strangers, they were so welcoming and friendly! After the class I looked further into what the project was all about and it was just such a different approach to fundraising and promoting awareness and bringing people together that I couldn’t help myself and wanted to get involved. I have continued to attend as many of the Pop Up Yoga events as I can and try to help out with their events in whatever way is possible for me. It just seemed the natural progression, to support someone that is helping others. -Amanda is one of the Yoga instructors for the I AM LOVE project Pop Up Yoga fundraisers! She lead 200 people through the Love For the Holidays class (where the fund have turned into donations that are being distracted on December 21)! Amanda is also my ‘regular’ Yoga instructor! Jodi and I attend her weekly Restorative and Meditation class and anytime she’s teaching at the studio near my home I sign up for her class! Amanda is a calm presence and is always looking to teach people about self love and self care. Well when I first heard about Amy and what she was doing I was so interested and loved the concept of giving back in the way that she is. Particularly through her pop up yoga events and crystal bracelets. I purchased my first one at prairie love and spoke with her about getting involved in any way I could to help give back. We met for coffee and talked all things yoga, life, community, passion projects. She asked me to teach at the Love for the Holidays event … her largest fundraiser to date. She and her team of volunteers managed to sell 200 tickets to support the event. I loved seeing how organized and driven she was/is and that she truly believes in the value of the work she’s doing. 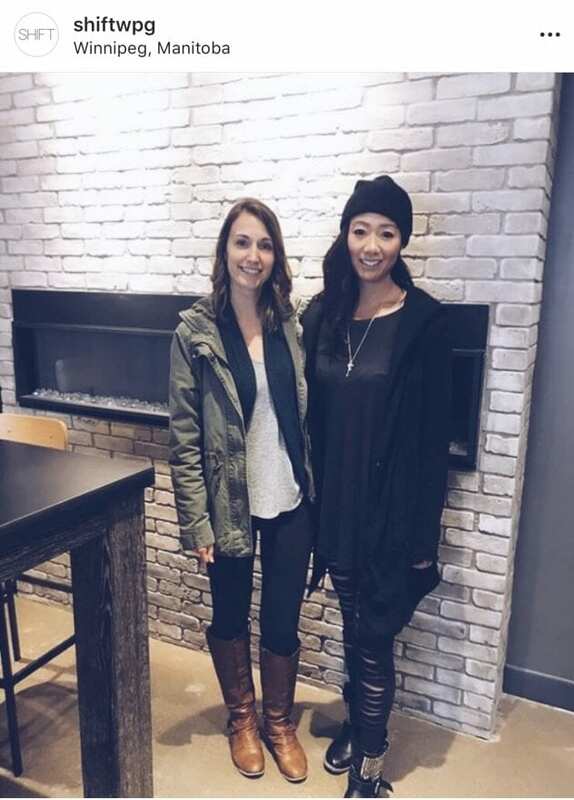 I’ve loved using yoga as a way to give back to the community but have not been able to do so on the same scale that she has … she knows a lot about fundraising the ins and outs and I felt it was a valuable learning experience for me too. Focus on an issue or a set of challenges that you really care about. Be bold and also realistic about your chances of success, do your research and make sure you know the issues and concerns very well. Try to find people you enjoy working with, pay attention to these relationships as well as ‘the cause’. Work on your oral and communication skills. Be creative in the way you do things; a little humour can go a long way. Always remember that good teams will achieve more than talented individuals. Do not get demoralized when things don’t work out; learn the lessons of failure. Keep a balance in your personal and work life, avoid burnout; you have your whole life of activism ahead of you. Because a lot of the stuff that I’ve been doing, I’ve had to organize and plan out a majority of the events on my own, I haven’t really had the time to take steps back and relax, but hopefully the new year will bring new opportunities of rest for me. Amy’s efforts within the I AM LOVE project are what social sustainability is all about. She is building community for people who maybe didn’t even know they could be part of something larger. She is telling people who may have forgotten…that they are loved. She is reminding people who are able to give about the impacts that giving to others has on our community. She is connecting businesses and everyday ‘ordinary’ people to causes that matter and that need attention. She is educating the people of Winnipeg (as well as Brandon and Calgary-where two of the Pop Up Yoga events have taken her so far) about resources that are available, who uses them and how we can make a difference to sustain such programs. Amy is sharing her message and the messages of those in need using her social media platform and presence. She is facilitating projects for people who want to think beyond themselves and help out those in need: whether that person is a child, a teenager, an adult, a senior, a man, a woman, a newcomer to Canada, someone who has lived here all their life, someone who needs help for a little while, someone who needs help for a longer term. She doesn’t look at the colour of skin, religion or sexual preference. She cares about humans. Amy’s message is that “everyone is worthy of love, should be loved, and feel loved.’ We should all take a moment to remind ourselves of that and then spread that message like it’s confetti! What I enjoy most about my experience with Amy is the feeling of connectedness. I’ve met her in person only twice and yet she immediately responded that she would do an interview with me. Maybe after learning more about the project someone else will be inspired to buy a bracelet her volunteers make, follow her on Instagram and see something that speaks to them, purchase a ticket for a Pop Up Yoga event, contact her about how they can be involved, contact her about a charity that needs support and recognition, volunteer at an event, volunteer to lead the Yoga, donate to the prizes or food at the events, join the Mama Bear Clan walk…the list could go on and on. Amy is the one who is dropping the stone in the water and we are all seeing the ripple effects she has been able to make. Thank you to Amy, Cheryl, Jodi, Amanda and the countless others that I do not know who work to make our world a better place! This entry was posted in Uncategorized and tagged Masters of Ed in SCI, sustainability on December 6, 2018 by dshrumm.